Natural, hunting instincts: intact. Leisurely walks with squirrels around: impossible! I teach dog training classes to the general public. Your average dog owners. Their needs are simple. They want a dog who can behave nicely in human society and, often, with little effort to obtain said results. There is absolutely nothing wrong with that. After all, who doesn’t want results with minimal effort? They also aren’t looking for a hiking buddy; they want a dog who’ll be content with short walks or just being let out into the back yard for bit. Time is at a premium and, in their hectic lives, the dog takes a back seat. Many like the idea of a dog but not the reality. They get a border collie because they want a smart dog and then they’re annoyed when it moves non-stop or herds the kids. They forget this is a dog bred to herd sheep over great distances all day long. They bring home a Jack Russell terrier and are annoyed when it digs up the yard or tries to chase squirrels on a walk. They forget this breed is an excellent ratter and digging is completely natural. We get a purebred dog because we expect it look and behave a particular way. . .but we forget the reality of this nature. That it needs to be expressed. That, if we won’t give the dog an outlet, he’ll find one on his own. Because that’s who he is even if that’s not what we want. I had a dog I fostered named Augie who was, what I would consider, the best dog for the average person/family. He didn’t want to do anything. The first time I let him loose in the house to explore, he sniffed around a little bit and then just plopped down into the middle of the living room to take a nap. He was the epitome of a bump on a log. I swear he got annoyed with me when I made him exercise and move around (and I don’t think it was just because he was overweight). Having owned active, do something dogs and previously fostered dogs of the same type. . .I didn’t know what to do with him. Honestly, he didn’t WANT me to do anything with him and that was a first for me. But that is what the average person wants in a canine companion. A very easy, laid back dog. Maybe just a step up from a stuffed animal. So why aren’t we breeding more companion dogs? That’s really what most people want. Yet they’ll still go out and buy a dog who could “do the work” when they don’t need a working dog! What’s the point in getting a herding dog when you don’t own stock? Why get a terrier when you don’t have a vermin problem? If you don’t take a sled to work, why get a dog bred to pull? I’m all for purpose-bred dogs. . .and companionship is a purpose. And it’s a far more necessary one in our current lives than that of the working dog. I know many of us with purpose-bred dogs (be it a sportmix or a breed historically bred for a certain task) look down on people breeding dogs “just for companionship.” Granted, our dogs serve that purpose as well but we want the dogs to maintain their ability to do that task rather than just look the part (I am personally a HUGE proponent of this). But should we really turn up our noses at people looking to purposefully breed better companion dogs? Especially knowing that these dogs are going to be less likely to end up in shelters because they’re too much for the average family? Knowing that they’re going to be better suited to contemporary lifestyle than the breeds whose instincts we’re bent on preserving? 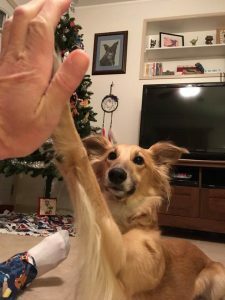 While it is true that breeding for high-level dogs will often result in pets better suited for average people, wouldn’t it be almost better for the goal to be simply pets for the average person? Regardless of your breeding decisions, there will always be outliers. Dogs bred for work who can’t do the work. Or dogs bred for pets that have to do the work. Society has changed and I know dogs will too. They’ve adapted to our changing lifestyles over their history with us. From hunting companions to farm guards and now snuggled up on the sofa. I think we’d find far fewer dogs in shelters or with people who are “at the end of the leash” with their dog’s intolerable behaviors if we focused more on making dogs what the average person wants. It’s been almost 2 months since Risa left this world. Grief still washes over me from time to time. 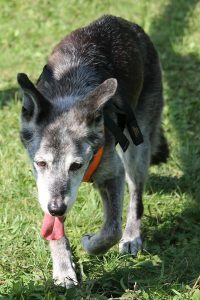 I still miss rubbing her neck ruff and placing my face where her muzzle met her head and just breathing in her scent. My face fit perfectly right there. . .like a matching puzzle piece. I’m pretty sure Kyu is handling it better than I am but there is no doubt things changed between the two of us after her passing. Partially because the little empath knows when I’m upset even if he doesn’t know why. And because the household dynamic changed. It feels like fall is failure time when it comes to training Kyu. I struggled with his training last autumn as well. (Likely due to a different stressor: job loss. I’m beginning to hate October.) He’s a very different dog than Risa and, for this, I’m mostly thankful! He’s really a delightful little dog who’s super playful and fun to be around. He’s also very easy to live with even if he is overly obsessed with squirrels and other dogs (it’s a work in progress). I know he and I got off to a bit of a rocky start but, truly, I love the little one. I knew he would come with his own set of challenges (as we all do!) that would force me to become a better trainer. After all, his predecessor did the same. She forced me to rethink what I thought I knew, learn more, and adapt. Kyu is following in her mighty pawprints. <3 Whereas I struggled with Risa's life skills (yay for fear and reactivity! ), Kyu and I are struggling with his sport training. I didn't realize it at the time, but Risa was a very forgiving dog when it came to training. She could take very little information from me and, somehow, figure it out. She was also willing to keep going and keep trying (yay for herding/working breeds!). I recently found one of our old videos of a shaping session and OMG I have no idea how she even figured out what I was asking for! LOL. She worked hard through silence and me staring off into space giving her no input whatsoever and, amazingly, managed to come up with the behavior I wanted. Yikes! I'm so glad I'm much better at shaping behaviors now! Risa would also work for long periods of time and just keep going with it. This was pretty reinforcing for me, too, as I also enjoy the training process! Kyu is not like that. While he can train for longer periods of time, he’s not going to work on the same thing for a half hour. Even if I switch things up and only work on each thing for a short period, he’s still not going to be into the game as much as Risa was. He is also incredibly sensitive to my moods and picks up on my frustration even more readily than Risa did (and she was also very sensitive). I’m also finding he needs things to be very clear or he’s likely to just give up. He doesn’t want to be “wrong” (moreso because of how I respond even though I try my best to make sure he realizes it’s not a big deal) so he will just stop if it’s unclear what I want. Which, of course, is hard for me because I’m human and it feels like my dog doesn’t want to work with me! I can objectively realize that it’s just information that I can use going forward in training. . .but that’s often hard to do in the moment! So I’m trying to figure out how to best train him so that I get the results I want and he is a happy and engaged partner. It’s hard. I’m finding it difficult to use some of the methods that have worked with Risa (and my students’ dogs) to train him. He loves to play and he loves to play WITH me (not just with toys) so I have that advantage. But it’s sometimes hard to incorporate play into training when I’m not used to doing so. I’m trying to watch and read his body moreso and be more mindful of breaking down the behaviors into smaller pieces so he can be successful and not frustrated. AND also to recognize when he’s “non-compliant” that maybe he really doesn’t know it as well as I thought and/or we haven’t worked on it in ages so maybe we should start at an earlier part of the process before I just assume he’s still got it. I’m also getting a little sneaky and trying to work it into our moments of play (either with toys or personal). Asking for a spin before I toss frizzee or something. I’m also trying REALLY hard to reward him for effort even if it’s wrong. Anything he tries = reinforcement of some kind. THIS IS HARD. Even though I know “wrong” is just information. Even though I know I want to keep training in the happy bucket (thanks, Amy Cook!) and focus on his attitude more than his performance/precision. Even though I know that he will not learn the “wrong thing” if I reward the “wrong thing” because I’ll change my training session accordingly so he doesn’t keep doing the “wrong thing. . .” IT IS HARD. I know he’s going to make me a better trainer just like Risa did. And I know he’s going to be an amazing, talented, and wonderful performance dog. It is just going to take some time. I was patient waiting for Risa to be ready (ha ha, okay, no I wasn’t but I still waited!). I have to do the same for Kyu. You may not be physically with me anymore, Risa, but you were such a part of me that you’ll never be truly gone. It’ll be 4 weeks tomorrow since I said our final “good bye.” It seems like no time at all and an eternity all at once. I’ve handled your passing better than I thought I would. Probably because I knew it was coming and had been mourning you for months prior to that final decision. Also because I knew it was the right choice for you. Even though I don’t think either of us was ready for it. I’m thankful I had a couple days to spend some special time with you and take you some places. And spoil you with food. Life’s cruelest joke to you: your love of food and your inability to eat so much of it without it destroying your gut! But you had some apple, a donut from a local bakery (not from Dunkin! ), some pizza, cheese, hot dog (the local specialty), tons of McDonalds fries, and a bowl of chocolate chip ice cream before you passed from this life. I still mourn for you. I miss kissing you between the eyes, rubbing your ears, and rolling the excess of neck skin you had between my fingers. I miss how good it felt to wrap my arms around your chest and hug you even if you weren’t always as into it as I was. I miss your smile; it never ceased to warm my heart and was your best feature. I miss everything you were to me. I know Kyu misses you too. He worshiped the ground you walked on since the day he arrived. I sent a small donation to the shelter I adopted you from to help other dogs find their special person (or people). And I fully intend to do exactly what I did while you were still here to honor what you were to me. I will continue to support pet rescue. I will continue to teach dog training classes so that people can have great relationships with their dogs like the one we shared. 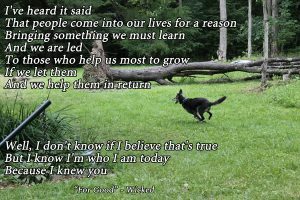 I will again open my home to foster rescue dogs to help them find their perfect family. Everything you taught me will be passed on. It’s the best way I can honor you. I hope, someday, I can have such a close relationship with another dog. Ours was close by necessity; I had to know you intimately to help you learn to cope with the world. Through that necessity, I learned that the best way to train any dog is by discovering what they need and listening to them. That we’re both a part of the process and communication goes both ways. I’ve still got a long way to go on my journey. . .but you started me in the right direction. Run free, my friend. Thank you for everything. It’s hard to believe over 12 years ago I brought you home from the shelter. Twelve years together and it still wasn’t enough. You’ve left a huge hole in my heart that will never be filled. I cannot believe you are gone. When I started looking for my first dog, I wanted a dog who could go anywhere and do anything. I wanted a dog to get involved in dog sports with (specifically agility). Your listing on Petfinder sounded like a perfect match. Like you were exactly what I’d been dreaming about. My disappointment was immense when I was told you were no longer available. . .only to be replaced by sheer joy when they realized you were there at the shelter instead of in your home. I drove 3 hours just to meet you. My mom told me she knew the only way you weren’t coming home with me was if you bit me. You had perfect half prick ears and the most wonderful smile. I knew it was meant to be. You were mine. You were always supposed to be mine. I took you home and you were not the dog I had dreamed of. I knew you were afraid. I knew you were going to be some work. You were a challenge. You were always a challenge. I was completely in over my head. I thought I knew dogs. You showed me how little I knew. I was frustrated. I didn’t know how to help you. But I wanted you. I wanted you to be happy. I wanted to figure out how to help you. So I did. I reached out to friends. I signed you up for training classes. I have no idea how I ended up in the clicker class but I know our journey would have taken a different path if I hadn’t. It was the way I was supposed to go. Training classes were always a blast! Despite your fears, you excelled at training. You loved it! I wanted to do more so I signed you up for freestyle despite my reservations about the sport. I didn’t want to do it. You were a rock star in the class and changed my mind. Freestyle was always your sport. You loved to perform. You were a ham. You lit up the stage. Our bond together was showcased every time we walked out into the performance space. So many times we danced together. As a team. As one unit. Demos. Competitions. It didn’t matter. We were one out there on the dance floor. You dabbled in other sports as well. 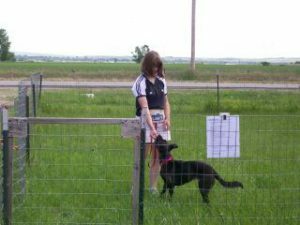 Rally, Rally-FrEe, obedience, agility, barn hunt, nosework, herding, and lure coursing. Lure coursing was your natural love. Running was your favorite activity and this was a great outlet for my beast. You’d drag me out onto the field barking and acting all crazy. 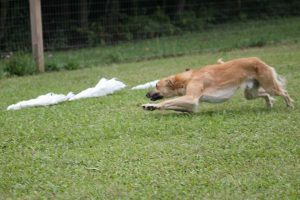 I loved watching your pure speed after that plastic bag bunny. The absolute joy on your face. Lure coursing was for you. Rally was for me. And freestyle was for us both. Together, we overcame a lot. You grew more confident and less fearful. 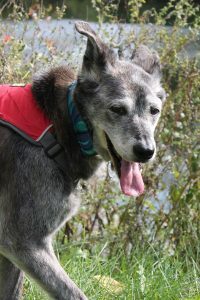 You beat the odds and became a success in dog sports despite your dog reactivity and fears. You survived cancer (mammary carcinoma when you were 9). You survived a slipped disc and IVDD diagnosis at 12 and still continued on in dog sports afterward. Your gastrointestinal tract was a mess for your entire life yet you thrived. We didn’t give up. You were my teacher and I tried my best to be a good student. You taught me so much. Not just about dog training. Not just about reactivity and fear. Not just about raw feeding, homecooked meals, or quality kibbles. Not just about cancer, gastrointestinal issues, back problems, and other health concerns. You taught me about life. You made me realize who I wanted to be and how to be a better me. I saw much of myself reflected in you. Like we were two souls intertwined. But you didn’t just teach me. Your guidance extended beyond just my life. You helped me raise foster dogs. You helped raise Kyu. You helped me fulfill my dream of being a dog trainer where I’m constantly spreading the knowledge you taught me. You taught our lure coursing operator how to help others catch their dogs after a run when the dog didn’t want to be done because you never wanted to be done with lure coursing and I needed to get you off the field! 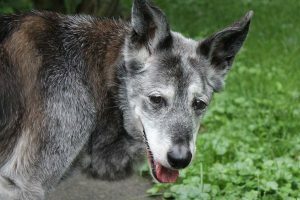 You taught your vet about the multitude of pain management options available. You have been the ripple. We’re all fortunate to have known you, Risa. You lived in three states. You walked in the Beartooth Mountains. You swam in Long Island Sound! You were practically famous. You were featured in the newspaper several times. Your photographs and personality populate several books. You’re even in a couple dog training DVDs!! I knew I was going to have to make a hard decision at the end. One last lesson I needed to learn. I tried everything I could to keep you comfortable and happy. But my options ran out. You hurt too much and I couldn’t ask you to stay. I knew it would only get worse. . .and there was nothing else I could do. I tried my best to spoil you over your last days. I stuffed you full of your favorite foods. I took you out to sniff and enjoy the world even though it was hard for you to get in and out of the car. I know it was the right choice but it was the hardest one I’ve ever made in regards to your care. How can I ever thank you enough for everything you’ve been to me? You were with me through my entire adult life. Through several moves and lay offs. Through good times and bad. You were my rock. . .and I was yours. I will continue to pass along all the knowledge gained from a lifetime with you. I will never forget you. I miss you so much. What I wouldn’t give to massage your neck ruff again and bury my head in it. How I miss your kisses on my chin and your amazing smile. You were my heart. And I will love you forever. Old age isn’t easy for any of us. I know I haven’t been keeping up on this blog as much as I used to. Life gets in the way and Risa’s been struggling lately. I’ve been struggling, too, with possible end of life decisions for her. I don’t think we’re there yet but I can’t help but think about it. Some days more than others. Pre-grieving, I believe it’s called. Risa’s been through and bounced back from so much but I know, some day, that will no longer be the case. I’m always trying to keep her quality of life at the forefront of my mind. I don’t want to lose her–EVER–but I won’t make her hold on for my sake. I owe her more than that. Deciding when the time could be, however, is always a challenge. It was weighing on my mind a lot the past month. A lot. Like not sleeping. Worrying that I might be reaching the limits of what I can do to help her feel comfortable. Her back injury is taking its toll. The nerve damage is showing. She stands wide, falls into a sit if she tries to make a tight turn, and she stood on her overturned right rear paw for at least 30 seconds the other day. It’s rare that she stands still–moving is more comfortable–and she has trouble getting up. She doesn’t even lie in her orthopedic bed anymore because I think she has trouble getting out of it. She chooses the flatter beds instead. Her right elbow is also acting up again which is troublesome when she places a lot of her weight on her front end because of her back end’s issues. She’s on three pain meds at the moment (tramadol, amantadine, and Tylenol). I stopped her gabapentin when it appeared that it’s use might be causing some of her issues. I’m no longer sure if that’s the case though she appeared to improve after I stopped it. She definitely had significantly worse neurological symptoms when I increased the dosage at my vet’s recommendation. It’s been a challenging balancing act trying to alleviate her discomfort. She’s also had a chronic urinary tract infection for several months; possibly even from as long as she’s been on prednisone. The pred definitely caused some urinary leakage (requiring washing of dog blankets at least weekly) and may have been the cause of her UTIs. After a third urinalysis came back positive for bacteria, I had concerns the pred was the problem. She’s on antibiotics again for at least 4 weeks to clear it up and I decided to discuss taking her off prednisone with our vet. Our TCVM vet had prescribed it and agreed with weaning her down. She gave me a schedule that would have her down to 1/4 of the dosage in about a month’s time. 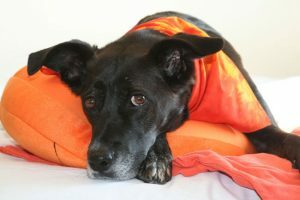 Unfortunately, Risa’s pain level has increased and the medications she’s on are insufficient to keep her comfortable. I had a chat with her general vet about the prednisone wean and he recommended we expedite the process so we can start Risa on NSAIDs again. It’s still a three week long wait but I think it’s truly her best option. We could potentially eliminate the UTI problem (assuming, of course, there isn’t anything else going on to cause it) but, more importantly, make her less painful. I find it funny that I was so against putting her on NSAIDs when she first injured her back and now that’s the thing I want to do for her most of all! Still trucking along and getting enjoyment out of life. Even if her pace is slower. I still worry that she’s not going to make it through the year. Winter is going to be hard on achy old bones. And snow is difficult to navigate. It’s hard to say how much longer she has. With her health issues over the years, I’m happy to see her approaching 15 years of age. I just hope that, whatever time she has left, it’s good time. Because that’s my biggest concern with her right now: quality of life. She still gets out for walks even if they’re short and slow. I still take her for outings when I can because it’s important to keep her mind active. We even got one last chance to dance together at this year’s local freestyle competition. I don’t know how I held it together but I did. And we truly enjoyed every moment together in the ring among our friends. I know the journey is coming to an end. I’m so thankful for it. I’m so appreciative of everything this dog has done for me, taught me about, and lead me to. She has been my rock. . .and I hers.